I was fortunate to meet Danielle, whose soul-warming laughter makes my work worth doing. Danielle graciously agreed to pose for this photo with me. Thank you Danielle! What an interesting day at the Gladstone Hotel in Toronto yesterday! It was nice to see so many folks duck inside the air-conditioned hotel to check out the Small Press & Literary Festival on such a warm and beautiful day. I had a wonderful time chatting with my neighbours Dwayne and Sarabeth. Both have huge hearts and a deep passion for their respective art forms. It was just an absolute joy getting to know them. You can see some of Sarabeth’s funny greeting cards here and Dwayne’s inspirational Stress Prevention Kit here. The other vendors were an eclectic and occasionally eccentric bunch. The ballroom that we were exhibiting in had an alcove situated behind me and just out of view from my table. There, I met a sweet old woman exhibiting her beautiful hand-bound hardcover miniature books. Some had digitally reproduced public domain stories, and others were blank notebooks. Throughout the day I met and spoke with other friendly and talented vendors. Into the afternoon, and out of the blue, the ballroom was filled with erratic harmonica music. I poked my head around the corner and into the alcove to see that sweet old woman rocking feverishly in her chair playing a tiny harmonica that couldn’t have been much more than two inches wide. Her elderly husband sat next to her, seemingly oblivious, with his head deep in a novel. That was a brilliant sight that I won’t soon forget. The visitors were fantastic. The reception to my new prints was great. There was one amazing person who really made my day. Her name is Danielle. That’s her in the photo with me at the top. She spent a considerable amount of time carefully reading through everything I had on display. Every time she looked at a print or poster, she laughed. A deep, hearty laugh that warmed my soul. She bought a book and it was a pleasure to dedicate it to her. I know it will be loved. 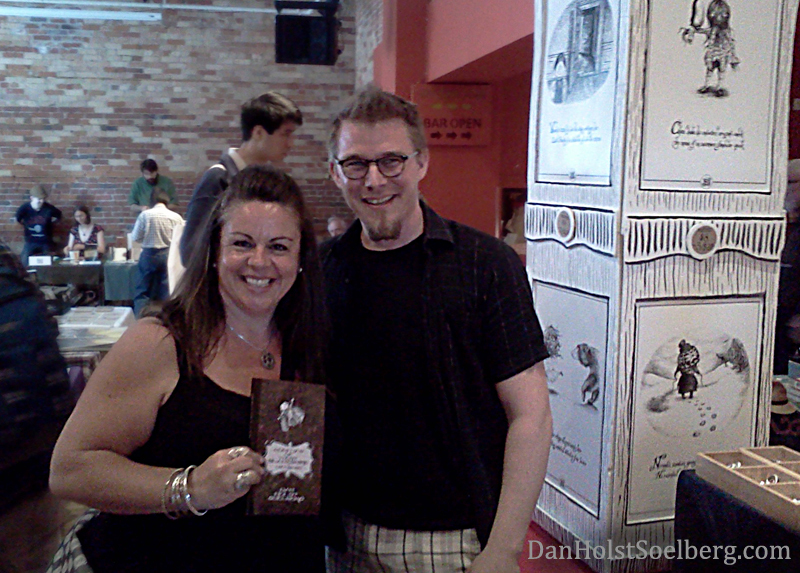 Thank you Danielle, and thank you Sheryl at Toronto Indie Arts Market for organizing another great event. “Viv is not adept at verbal rebuttal. Her revenge is exacted in ways not so subtle.” From the book Oddities of West Blankshire. There are many reasons why death and despair are not funny. But reason has very little to do with why anything is funny. In fact, the house that funny built has shut the door on reason. When we laugh, we forget for a moment all the reasons why we shouldn’t. That’s what makes humour such a powerful force. 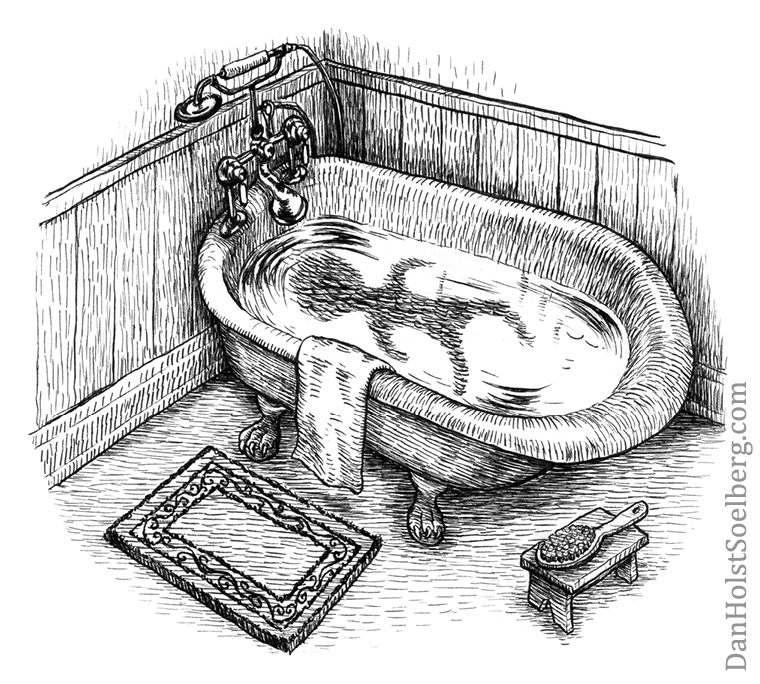 “Lou bathed for weeks hoping gills would evolve, but he became oversaturated and dissolved.” from the book Oddities of West Blankshire. Macabre humour is simply delectable. It is my passion. I am essentially laughing at death and despair, and there is something cathartic and exciting about that. I can’t get enough of it, which is why I keep putting more of it into the world. I find great joy in making books that both celebrate and poke fun at the darkest and most disturbing aspects of humanity. 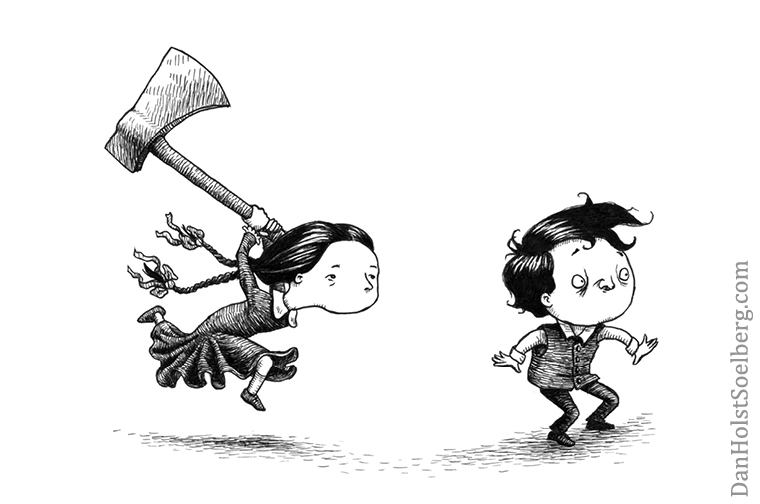 I want to stress the importance of putting macabre humour in book form. Equal to my passion for macabre humour is my passion for books. Books are beautiful and sacred objects. Books are also personal and intimate. When you read, the book becomes your world and the words express an aspect of who you are. Maybe I’m sounding hokey or overly dramatic, but that’s what books do for me. I didn’t realize how personal and sentimental my books were for readers until I met a young man at Fan Expo in Toronto last year. He picked up a copy of Oddities of West Blankshire from my table and leafed through it carefully, page by page. 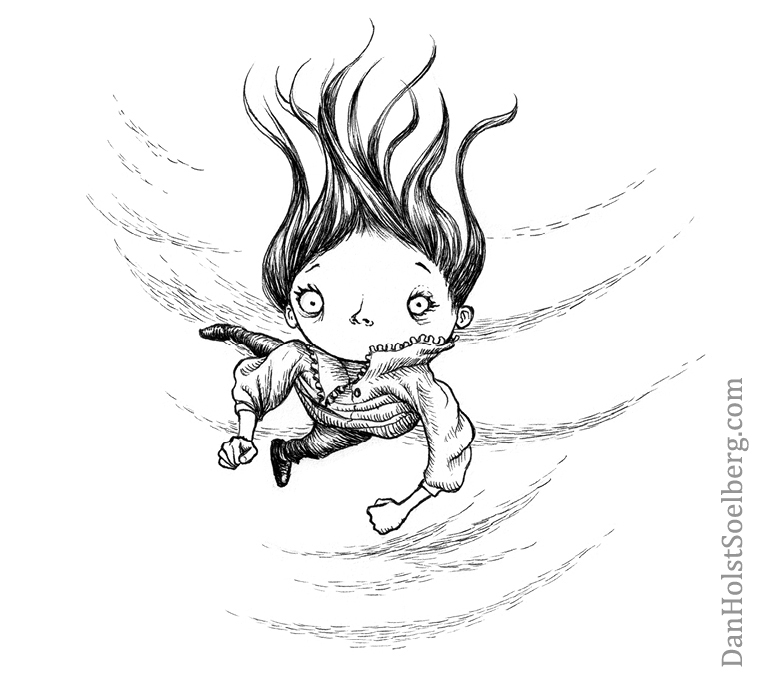 “Paloma is plummeting fast through the sky. She cannot recall when this started or why.” From the book Oddities of West Blankshire. Then he reread a few choice pages and sheepishly looked up at me, waiting to catch my gaze. I connected with him immediately. He said that his childhood friend owned a copy of my book. He had fond memories of visiting his friend and reading the book over and over and over. He told me he was nervous and excited to meet me. Then he asked me to sign a copy for him and thanked me profusely before leaving. I was floored. Not just because the book was only five years old (yep, I’m already the old guy!) but because something I created went out into the world and gave personal meaning to a complete stranger. If I could tell one story that explains why I continue to make books, it’s that one. Every book I sell connects me with one more person in the world who shares my passion for macabre humour. There is nothing more rewarding than that. My books can be purchased at the “Shop” link above. Below is a speed drawing video of a page from my latest book “Dwellers of Lurching Swill”. My display includes various merchandise. Pictured here: buttons featuring images from my books. I love exhibiting. It’s energizing and fun. It’s especially exciting to connect with fans since my creative process is such a solitary one. From original idea to finished product, I create each book alone in my studio. And it takes time. I toil over the writing, illustration, type rendering, design and layout of each book to satisfy the vision in my head. Months and months of solitude, and the only thing compelling me to finish the project is the thought, “the finished book is worth all this effort.” So, to meet a fan that connects with my vision, buys a book and is now anxiously awaiting my next book, it’s just the most satisfying feeling. The Mixed Media Market that happened at the Gladstone this past Saturday was everything I could have imagined. Visitors were engaged with the vendors and the event was superbly organized. I stood behind my display for six hours. I can’t think of a better way to strike up a conversation with a stranger. Just a note: I didn’t have the forethought to take photos with my fans, and I realize that an article about fans without a photo of one feels incomplete. On the other hand, you can use your imagination and I like that. I met Sarah. Sarah was visiting Toronto to see her brother nearby and stopped in to kill time. She was intrigued by my display and we talked about my work. Sarah wound up buying all three softcovers. I signed them and dedicated one to her. Every show, I connect with at least one person who fully shares my passion for the work I do and makes sure to let me know. Sarah was the one who made this day worthwhile. I humbly thank you, Sarah. I met Michael. He bought a book as well. Michael was in Toronto on business at his PR firm’s head office. He lives in Chicago. I’m a Frank Lloyd Wright fan and I know that Wright’s work is all over Chicago. I asked Michael about it. As he gave me his card, he told me to call him when I visit, we’ll meet for dinner and he’ll tell me all about Chicago. I can’t wait! I’m taking my family for a visit this summer and I know who I’m calling. I met another proud new owner of my book who had a familiar accent. I didn’t catch his name (he was in a rush), but he said he was heading back to Copenhagen. We chatted a bit in Danish and he went off to give my book a new home in another part of the world. I met Johanne. She bought a book and we chatted while I dedicated it to her. Johanne was curious about why I’d chosen to self-publish. I explained that I just wanted to make books and didn’t want to worry about getting approval from a publisher. For my next book however, I explained that want to get an agent and publish in the UK or USA. Johanne revealed that she has been working in Canadian publishing for years. Based on her experience, Johanne warned that agents can be heel-dragging and money-draining. She said that small Canadian publishers on the other hand, are passionate about the work they do and work tirelessly for their authors. In fact, she said that Canadian publishers are devoted to the point of personal sacrifice. It gave me pause to consider what I want to do with my next book. Maybe an agent is the wrong move? I really don’t know. As the day drew to a close, I felt a sense of vindication for the long hours in the studio that make my work feel self-indulgent and reclusive. I am a social beast just like everyone else, and at the end of the day, my books only have meaning when people other than me read them. After a fun day like this, I am full of gusto and eager to get back to the studio! The next Gladstone Hotel event that I’m taking part in happens May 25th. It’s the Small Press & Literary Festival taking place between 10:30am and 4:30pm. For details, click this link. I’ll keep you updated on my facebook page too. Please come by on the 25th and bring a friend. I love meeting new people.